The Office of Industrial Economics (OIE) has ordered car manufacturers and distributors to comply with the Euro 5 standard on all Thai-made and imported vehicles sold locally by 2021, while hybrid and plug-in hybrid electric vehicles (EVs) must also comply with Euro 6. All related parties have a grace period of 1-2 years to comply. The move is expected to reduce the smog and PM2.5 particles in the country, mainly released from car emissions. But the time frame of the National Environment Board to enforce the Euro 5 standard is 2023. Thai-made passenger cars and pickups comply with the Euro 4 standard, but eco-cars under the second phase, totalling 27 models, follow the stricter Euro 5 regulations. Eleven mid-sized and large Thai-made vehicle models meet Euro 5, as well as 19 imported passenger cars. Some 84 imported cars meet the Euro 6 standard. Only diesel-powered buses and trucks on the roads still meet Euro 3. 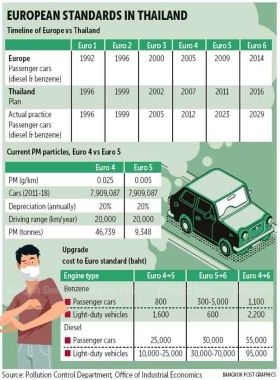 Nattapol Rangsitpol, OIE's director-general, said the office conducted a study and found that once all vehicles comply with Euro 5 within two years, Thailand can reduce PM2.5 particles by 80% or 37,391 tonnes from 2020. He said the OIE has been calling for an upgrade to Euro 5, but many car manufacturers pushed back against the plan, saying it would cost roughly 15,000-20,000 baht more per car. "We already estimated the extra cost and it will not be as high as the manufacturers mentioned," Mr Nattapol said. The OIE has not yet received positive responses from automakers about upgrading to the Euro 5 standard. "But based on market sentiment, each automaker is introducing new models compliant with Euro 5, not Euro 4," Mr Nattapol said. Germany has been through extensive court tests, and began last year to ban all diesel vehicles that were not Euro 5-compliant.